This rug is absolutely beautiful! The colors are vibrant and very good Quality. It matched my living room colors perfect! Was the perfect fit! 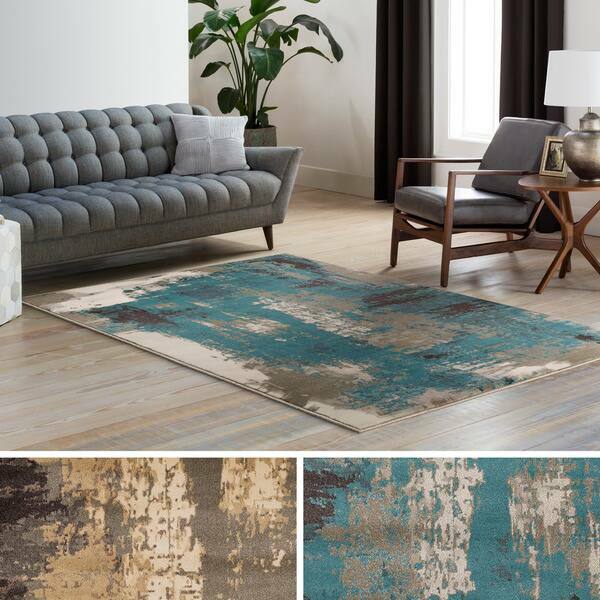 Milana Teal Abstract Area Rug - 7'9" x 11'2"
Give your decor a warm pop with this contemporary rug. This machine made rug features a modern design in bold colors that grabs the attention of anyone walking into the room. This rug is resplendent in its color and its suppleness, expertly designed with an eye toward style. This ease-of-care rug is aesthetically attractive and plush underfoot. This is really a beautiful rug! I actually bought 2. The colors are striking and the pattern is great. I will mention though, unless a piece of furniture is not sitting on the rug, it will slide over carpet and move. But definitely would recommend! 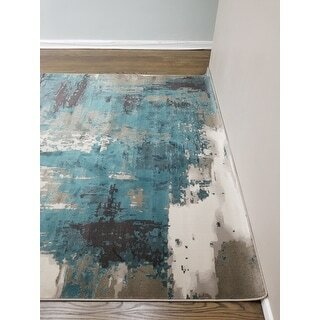 I purchased the teal/brown/grey rugs. The colors are true and the rug is well made. As stated this is a machine made rug but it looks great. Would recommend to anyone that likes the colors because it looks great! I love this area rug! The pattern fits my living room which is a medium gray perfectly and is soft on my feet. I really wasn't sure what to expect when I ordered this rug. It's hard to know the exact colors on the computer. I took a leap of faith, and I'm glad I did. While it doesn't work for my living room colors since the blue is more of a dark teal blue rather than aqua, it will work for my bedroom. The rug is beautiful. It has so many different beige/tan shades that I know I can find many different accent decor that will match right along with this rug. I'm very happy with this rug. Loved this item. The colors were beautiful. The rug feels great under you feet. Unfortunately it was not large enough and did not come in a larger size so I had to return it. The color blend in this rug is awesome. 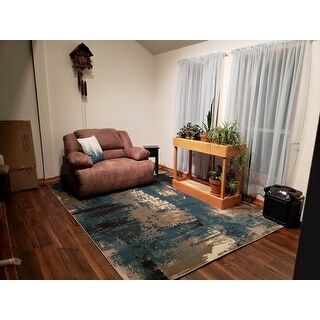 I was torn between getting the brown or turquoise rug. Both are beautiful!!! I purchased the brown rug for my family room and it's perfect! I often get compliments from guest. I would definitely recommend this rug in any color offered! The Phelan accent and area rug is simply beautiful in my foyer area. The foyer is a busy traffic area in my house. The color is just right for a busy area where everyone one enters. I would definitely recommend this rug to buyers. The previous rug I had attract a lot of dirt because it was to light. Beautiful in person. Fits living room of open floor plan very nicely. Just enough pile for comfort. One of the best online purchases I've made. I love this rug, it is softer and just slightly more plush than expected it to be. The only complaint I had was that there was a large 'whiteish' splotch along one side that didn't seem to flow as well with the design. (It's made like that but I didn't really like that part of it). But I just covered that up with a piece of furniture and it looks great! Colors are very dark compared to the screen. Ours had little to no beige, creamy color and was mostly gray and dark teal. We are returning it. Very nice colors. I am pleased with it. Super cute great colors. Love! Matches my new room perfectly. Beautiful, durable rug! It arrived with two areas of the border snagged. But did not create too much of a problem. I bought this as a gift for my daughter. She loves it. The colors blended great with her furniture and looks great. Overall she has no complaints with the care or quality. Beautiful colors in this rug. It has some weight so it doesn't slide around on the hardwood floor in my house so easily. "Is the darkest color in the rug black? Or is it a brown or navy? It’s hard to tell on my phone. " I actually purchased the brown/camel rug. There is some black areas in the rug which is the darkest color. The majority colors in this rug is brown and a taupe color; exactly as pictured. I'm guessing the Aqua blue and taupe-ish grey rug is exactly as pictured. It's a beautiful rug! "Is the Aqua rug more of a teal color than aqua, as a previous person noted?" It's definitely mostly teal. It does have slight variations in color throughout the rug for a blended look so there are small patches that are aqua. But I would say that 90% of the blue coloring is what I consider teal. "Can you please tell me if there is a matching runner to go with this rug?" We currently do not offer a runner size. "Does the camel color rug have shades of gray mixed in or are they all browns and beiges?" "Is it a true teal (blue/green) color or aqua (blue)? And what is the thiclness of the rug fiber?" "Is there a metallic tint to the gold rug?" Style Haven Faded Impressions Abstract Brown/Gold Area Rug (5'3 x 7'6) - 5'3" x 7'6"